What conditions does Levsin treat? Tell your doctor right away if any of these unlikely but serious side effects occur: mental/mood changes (e.g., confusion, unusual excitement), fast/irregular heartbeat, difficulty urinating, decreased sexual ability, loss of coordination, slurred speech, vomiting. List Levsin side effects by likelihood and severity. This medication should not be used if you have certain medical conditions. Before using this medicine, consult your doctor or pharmacist if you have: enlarged prostate, urinary blockage problems, certain stomach/intestinal problems (e.g., slow gut, blockage, severe ulcerative colitis, infection), heart problems due to severe bleeding. Before using this medication, tell your doctor or pharmacist your medical history, especially of: personal or family history of glaucoma (angle-closure type), overactive thyroid, other heart problems (e.g., coronary heart disease, congestive heart failure, fast heartbeat, arrhythmias), high blood pressure, kidney disease, heartburn problems (acid reflux, hiatal hernia), certain nervous system problem (autonomic neuropathy), myasthenia gravis. What should I know regarding pregnancy, nursing and administering Levsin to children or the elderly? This drug should not be used with the following medications because very serious interactions may occur: pramlintide. If you are currently using any of these medications listed above, tell your doctor or pharmacist before starting hyoscyamine. Before using this medication, tell your doctor or pharmacist of all prescription and nonprescription/herbal products you may use, especially of: amantadine, certain anti-arrhythmic drugs (e.g., disopyramide, quinidine), anticholinergic drugs (e.g., atropine, glycopyrrolate, scopolamine), antispasmodic drugs (e.g., clidinium, dicyclomine, propantheline), certain anti-Parkinson's drugs (e.g., benztropine, trihexyphenidyl), certain azole anti-fungal drugs (ketoconazole, itraconazole), belladonna alkaloids, bisphosphonate drugs (e.g., alendronate, risedronate), corticosteroids (e.g., prednisone), digoxin (slow-dissolving tablets), MAO inhibitors (isocarboxazid, linezolid, methylene blue, moclobemide, phenelzine, procarbazine, rasagiline, safinamide, selegiline, tranylcypromine), potassium tablets/capsules. Tell your doctor or pharmacist if you also take drugs that cause drowsiness such as: certain antihistamines (e.g., diphenhydramine, meclizine), medicine for sleep or anxiety (e.g., alprazolam, diazepam, zolpidem), muscle relaxants, narcotic pain relievers (e.g., codeine), psychiatric medicines (e.g., chlorpromazine, haloperidol, amitriptyline, risperidone). Does Levsin interact with other medications? 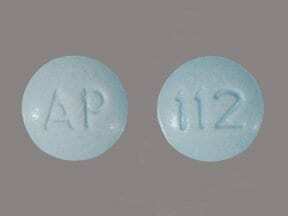 This medicine is a blue, round, tablet imprinted with "AP" and "112". Are you considering switching to Levsin? How long have you been taking Levsin?